In 2006 I trekked the Annapurna Circuit with three friends. We travelled independently. We hired no porters, and carried all our equipment for the 18-day hike on our backs. Neither did we hire a guide, but it wasn’t necessary. The trail was broad and well-marked, and there were plenty of villages with people to ask along the way. And we carried two very effective guides in our pockets. The top two English-language publishers of trekking guidebooks for the Himalayas are Trailblazer and Cicerone. My friend Huw carried the Trailblazer guide to the Annapurnas, and I had the Cicerone version, which at the time was written by Kev Reynolds. The two books seemed to complement each other, working together as a team to guide us along the route and choose where to stay each night. Three years later I solo-trekked up the Gokyo Valley in the Everest region and crossed the Renjo La pass. To reduce weight I only carried one guidebook with me. I had the Cicerone guide to the Everest region, which again happened to be written by Kev Reynolds. What a life it must be, hiking the trails of Nepal, visiting every teahouse and campsite, admiring every view and writing about it. On his website Kev Reynolds describes himself as “the man with the world’s best job, earning a modest crust by writing and lecturing about some of the most scenically spectacular places on earth”. To get a better idea of just how contented a man Kev Reynolds is, I decided to read his latest book Abode of the Gods (well OK, that’s not really the reason I read it – Cicerone asked me if I wanted to review it, and I told them it was right up my street). 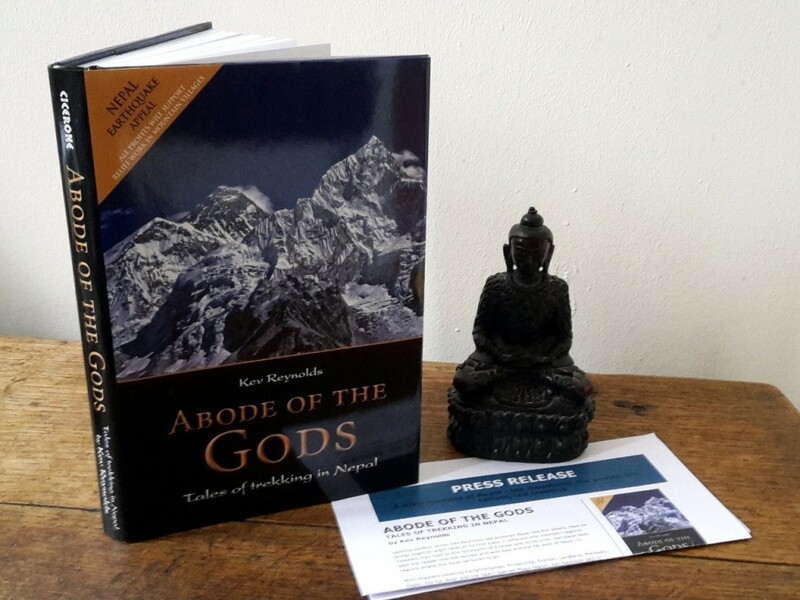 Abode of the Gods can best be described as an edited version of Kev’s Nepal diaries, describing eight treks in the country over a 23-year period. 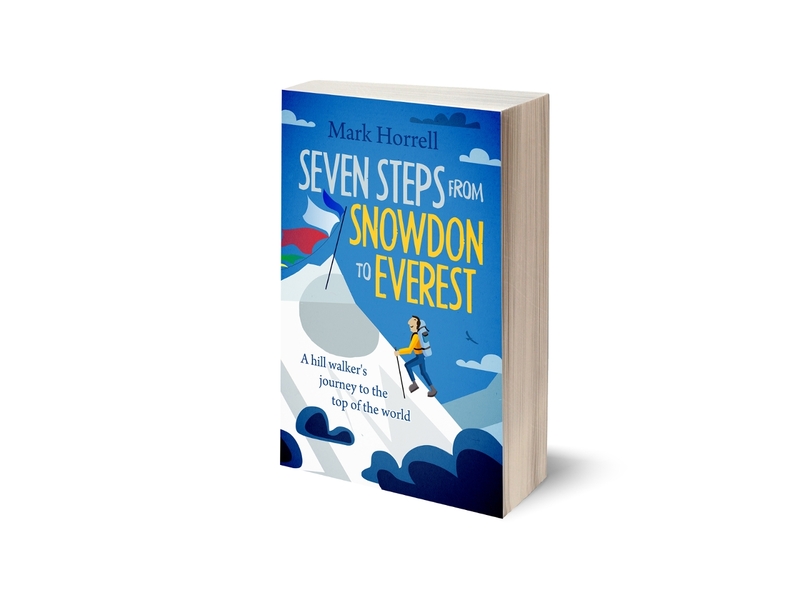 The treks appear chronologically, and illustrate his evolving journey as a traveller to Nepal. He’s tried every conceivable style of trek over the years: as a commercial client on a group camping trek, teahouse trekking independently with a friend, and as a group leader organising his own commercial trek. His later treks were to remoter parts of Nepal and more exploratory in nature. He describes a physically-exhausting one in the far west with just his Sherpa friend and some porters. There is even one where he travels on horseback (you could argue this doesn’t really qualify as a trek, but that would be churlish). 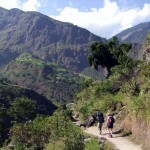 Each of the eight treks covers a different trekking region. 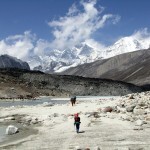 He describes teahouse treks in the three most popular trekking destinations: Annapurna, Everest and Langtang. He travels to the Manaslu region, where teahouse accommodation is gradually improving, and to Kangchenjunga and Dolpo, which are now seeing more visitors for camping treks. 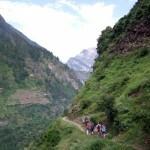 He also describes treks around Api, Saipal and Mugu in the west of Nepal. These areas see very few tourists, but the scenery is every bit as spectacular. What struck me most about Abode of the Gods is that despite visiting the country again and again, he never seems to lose his sense of wonder. His first trip to Nepal was to the Kangchenjunga region. His descriptions of the scenery are beyond enthusiastic, as you might expect for a first time visitor to the Himalayas. Fragrances drawn from the vegetation by the morning sun are intense, yet they are so kaleidoscopic in complexity that I fail to separate them into individual scents. Instead I have to content myself with their overall effect. Sounds, too, are beyond my frail ability to recognise and define them. Exotic birds with fanciful plumage swoop from tree to bush and back up to tree again, there to warble their morning anthems while the piercing electric cadence of a million unseen cicadas builds to a deafening pitch. If you’ve never been to the Himalayas then you might find this a little over-the-top. But I have, and although I’ve never tried separating a smell into its individual constituent parts, I can vouch for the sensory overload that is not easy to describe without drooling. He arrived home, and – as many first-time visitors to Nepal do – he vowed to return. That trek of a lifetime could not be filed away in memory as a one-off;” he said. “I’d have to return to the Himalaya. By Chapter 5, when he is teahouse trekking in Langtang, on what is at least his fifth visit to Nepal, his enthusiasm for the landscape is undiminished. Every hinted valley, every distant summit, every thatched house and landmark tree is registered in my mind as part of a landscape I shall carry with me in the years ahead. The final chapter of the book describes a trek in the untravelled Mugu region fifteen years after the events of the preceding chapter. By then he must have visited Nepal more times than Joanna Lumley. Ill health meant he had to travel by horseback over gentler terrain, but he carried the same delight in the landscape as he did the first time. There are no mountains in view, no glaciers or snowfields, but this has to be one of the most romantic scenes I’ve witnessed in the Himalaya. Its beauty is poured into the well of memory, and I know I’ll drink from it many times in the years ahead. In many ways Kev Reynolds is the ideal trekker, relentlessly happy, yet relaxed and calm when things don’t go to plan. On the few occasions when his irritation bubbles to the surface, it is usually for something minor, and he quickly repents and reproaches himself in the very next paragraph. Unlike many trekkers, he identifies with his local crew and is at pains to learn their names. He recognises some of them from trek to trek. One Sherpa whom he met in the Alps became his friend, and organised many treks for him in Nepal in the ensuing years. Part of his contentment undoubtedly springs from identifying with the Buddhist values of Nepali mountain people. I sense a rare spiritual dimension to the valley through which we travel … I share the Buddhist’s strength of appreciation of each mountain, valley, tree, rock, stream and river … a recognition of man’s temporary place here, of the impermanence of all things. 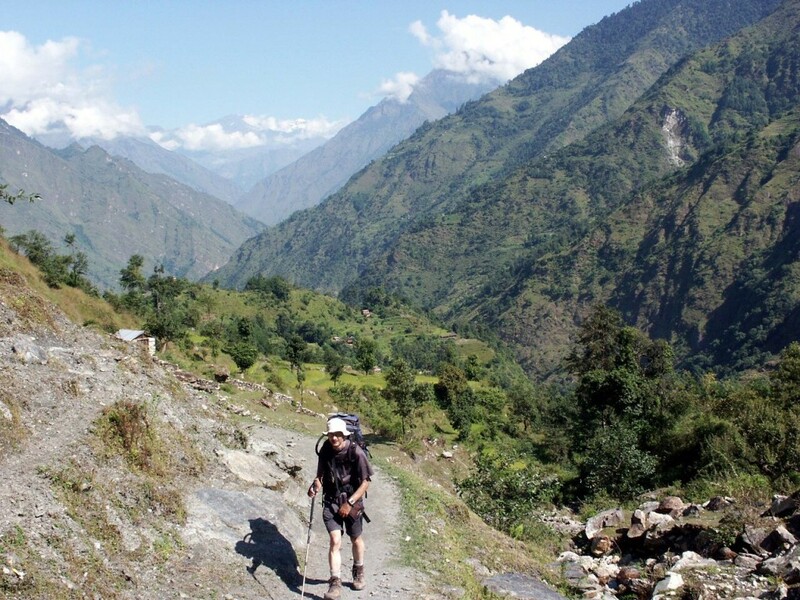 On trek in Mugu, Kev Reynolds follows the same philosophy. We sweat in sunshine, but are chilled the moment a cloud casts shadow. There are no consistencies, and I accept each moment for the gift it is. Another thing I found refreshing about his outlook is that he is content to simply trek among amazing scenery. It isn’t the challenge that draws him to the mountains; he was never tempted to become a climber, and has no wish to raise his profile by completing impressive feats. And when he stands among prayer flags on top of Kala Pattar with his friend and gazes up at Everest, his feelings are neither covetous nor judgemental. Having climbed many a mountain together, Alan and I have no dreams of climbing the highest of them all, but are content to let others follow that dream. We, mere trekkers, are drawn to its shadow. While we don’t all share Kev Reynolds’ Buddhist equanimity, there is much in Abode of the Gods that the regular trekker in Nepal can relate to. There are porter strikes; a lecture on the effects of high altitude at a health post in Manang; watching the hard work of the kitchen crew as they get up early and go to bed late; yaks on the trail, forcing him to take evasive action; studying a Himalayan peak (in this case Pumori), and trying to trace a practical route up; scrambling up a small peak beside a pass and having it to himself; a visit to a gompa (monastery) that is more like a museum; a dodgy footbridge over a crashing river; satellite dishes and solar panels in an otherwise mediaeval village; and, of course, mountains as far as the eye can see. I do have a couple of minor criticisms. The book is best dipped into a chapter at a time, rather than read in a continuous sequence, as each chapter can be a bit samey. By reading it over a longer period and coming back to it, I found I enjoyed it a lot more. It’s also fair to say Kev’s relentlessly enthusiastic outlook won’t be everyone’s cup of tea. This is not a criticism of him or his style of writing, but it’s just something to be aware of if you’re thinking of reading it. Not everyone wants to hear someone purring contentedly for 250 pages, and some people prefer a bit more conflict. I have to admit to having a little of that myself. There were times when I wished he would burst into a Paul Theroux-like rant about humourless officials at the plethora of police/army/Maoist/national park checkpoints, or a Brysonesque critique on the ludicrousness of pseudo-western Himalayan trek lunches. On Page 69 (appropriately enough), when he hears a young couple shagging in the room next door through the plywood walls of a teahouse, I would have liked to see him whip out his iPad and play Ravel’s Bolero back through the wall at maximum volume. But that’s just me. Many people will love this book. Everyone who has travelled in Nepal will find something to like about it, and most will find themselves nodding in recognition at several passages. And if you’ve not been to the Himalayas, some of his descriptions are more vivid than any photograph. Above all, Abode of the Gods is a great tribute to Nepal, and the best love letter anyone could pen to a country that has become their second home. I enjoyed it a good deal, almost as much as I enjoyed his guidebooks. He’s a lucky man, and I can think of no higher compliment than to admit that I would like to be Kev Reynolds. Note: Cicerone sent me a free copy of this book to review.